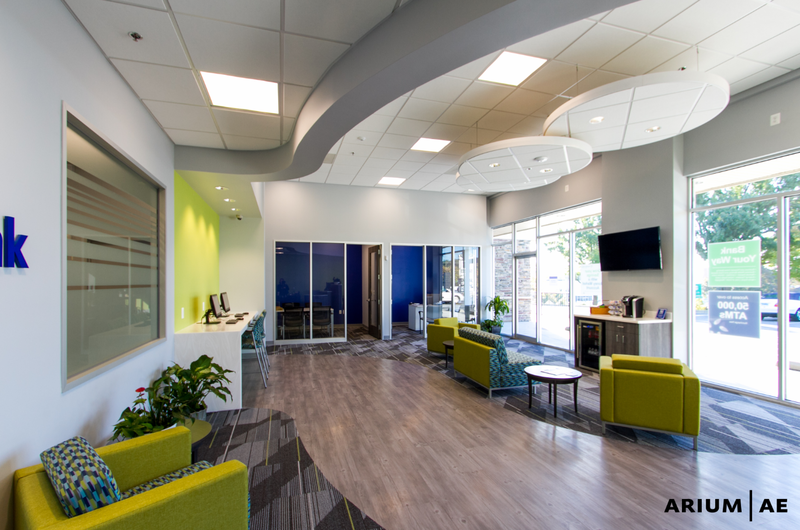 Hamilton Bank’s new prototype branch transforms the banking experience. Founded in 1915, Hamilton Bank is a community bank serving the Greater Baltimore area, with headquarters in Towson, MD. Hamilton was looking to relocate their Ellicott City branch and make some significant improvements to their customer experience. They turned to Arium AE to assist them with the design of a new prototype bank branch that would transform the way customers interact with the bank. Situated in close proximity to the entrance is a teller pod; this central and casual transaction space is significantly different from a more traditional teller line and window. This configuration allows the banker to work more closely with the customer across a variety of banking activities within a minimally-staffed branch. A “smart bar” area provides the customer with the freedom to access their own banking online, check their balance, or pay bills. Private back-of-house spaces are screened from the customer to ensure security. The glass-fronted office and meeting rooms appear open and inviting, however they can be acoustically private when needed. 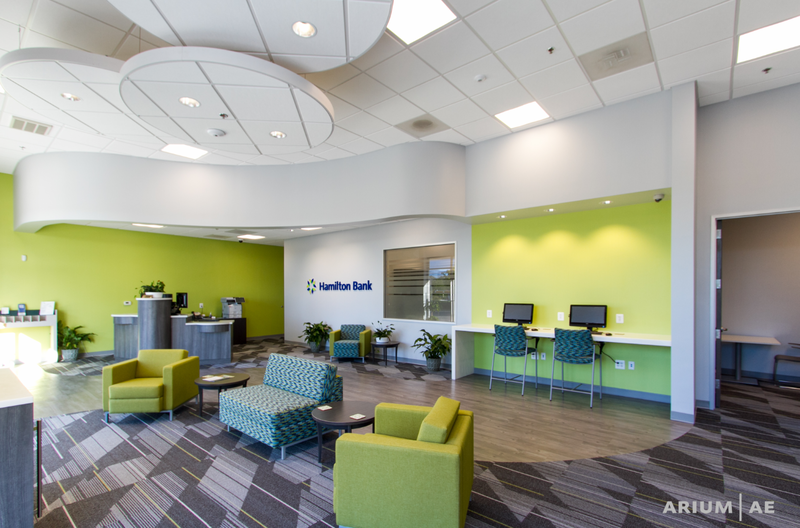 The space welcomes customers with ample daylight and vibrant colors reinforcing Hamilton Bank’s brand identity. The new branch utilizes ample natural light to compliment the vibrant tones of interior finishes that reinforce the bank’s brand identity. Curvilinear forms reinforce the freeform atmosphere of this contemporary banking environment. © 2019 Arium AE, LLC. *All services provided under Maryland’s Small Business Reserve Program projects are contracted for by Arium AE’s parent company Arium Acorn LLC. *All services provided in North Carolina are completed by Arium AE’s parent company Arium Acorn, LLC.